Oh lordy, Ill-inois messes up the big things, such as public worker pensions and paying bills on time, as well the little things, such as road signs. This one, which greets visitors to Lock 16 in LaSalle, reads, "Keep Illinois Clean, Please Don,t Liter." There are two errors here. I saw two other botched signs, including one deep inside beautiful Buffalo Rock State Park. I can't remember for certain where I encountered the third one, but it have been at Illini State Park on the other side of the Illinois River. 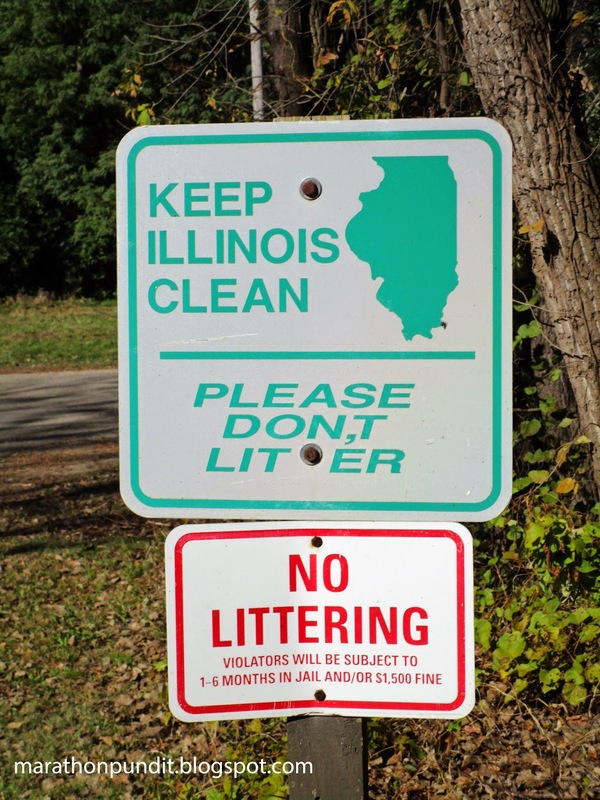 This sign should instead say, "Keep Illinois Clean, Please Don't Litter." The red-and-white sign seems to be grammatically correct. About 50 yards from this placard, I saw a gang of wild turkeys picking through roadside trash. One person's trash is a healthy liter for turkeys. On a serious note: How many of these signs were made? Who signed off on them? How much will it cost to replace them? As for Illinois' cleanliness, if you look at the state's nationally-known history of public corruption--four of our last nine elected governors have served time in federal prison, and the current one, Pat Quinn, is under federal investigation--the Prairie State is far from tidy.